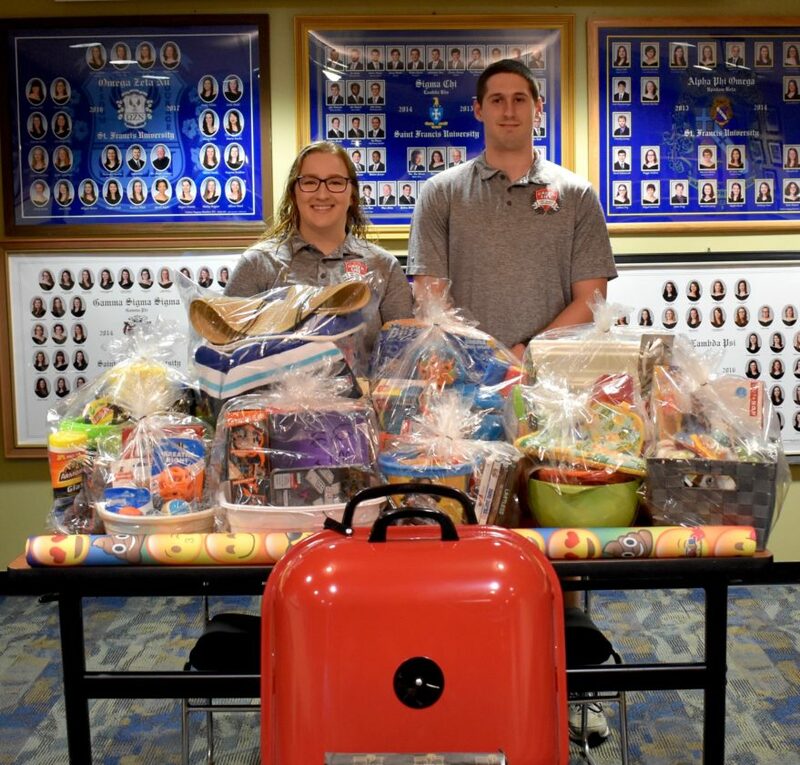 Clarisse Spencer and Tony Roefaro, students at Saint Francis University, Loretto, are shown with baskets that their Greek organizations donated to a fundraiser. LORETTO — Saint Francis University’s Inter-Fraternity Council and Inter-Sorority Council agreed to create and donate 10 baskets, including a charcoal grill, to a fundraiser to benefit Central Cambria High School graduate Ally Gergely, who died in a tragic accident this March. Ally was 22 years old and without life insurance. Her family hosted a fundraising basket party on May 6 at Bishop Carroll High School in Ebensburg to raise money to pay for funeral and burial expenses. BATON ROUGE, La. — Courtney Kunselman of DuBois was initiated into The Honor Society of Phi Kappa Phi. Kunselman was initiated at the U.S. Air Force Academy. LORETTO — Saint Francis University acknowledged students who helped co-direct The Rural Outreach Chemistry for Kids (ROCK) program throughout the 2017-18 academic year. The program completed its 23rd year of collaborative work with local K-12 schools in Blair, Bedford, Cambria, Somerset, Westmoreland and Clearfield counties. In the 2017-18 school year, ROCK coordinated and completed 216 events for 5,662 youth. The focus of the program is to encourage SFU chemistry students to further their involvement in the field of science by engaging with younger students’ through hands-on science activities. Some of the age-appropriate activities the ROCK program conducted include, liquid nitrogen and dry ice experiments, food chemistry, and slime and silly putty. Time and attention is directed toward smaller, underserved schools in rural areas, while also expanding the program to new schools and organizations. Rising chemistry seniors Grace McKernan, Bryant Onkst, and Paul Kasunic served as the program co-directors throughout the academic year. Over the last 22 academic years, more than 62,000 K-12 students have participated in hands-on activities through ROCK. During a ROCK event, the leader accompanies 3-4 assistants/volunteers to a classroom. The leader provides the science context and background. With the help of the assistants, the SFU group leads the students through an activity designed to enhance the scientific method of discovery. Attention to the individual is stressed, and the program’s focus is on small classrooms where there is more opportunity for personal interaction between students and volunteers. BATON ROUGE, La. — Sarah E. Kurz of Hesston recently was awarded a Love of Learning Award worth $500 from The Honor Society of Phi Kappa Phi, the nation’s oldest and most selective collegiate honor society for all academic disciplines. Kurz is one of 100 recipients nationwide to receive the award. Awarded twice a year, Love of Learning Awards are designed to help fund post-baccalaureate professional development for active Phi Kappa Phi members including graduate or professional studies, doctoral dissertations, continuing education, travel related to teaching and research, career development and more. Kurz, a recent graduate of Eastern Michigan University’s Higher Education Student Affairs master’s program, will use funds from the award to support the purchase of books and supplies as she begins her coursework in the Higher Education Management Ph.D. program at the University of Pittsburgh in the fall. Kurz was initiated into Phi Kappa Phi in 2018 at Eastern Michigan University. SUMMERDALE — Lori Delk of Altoona was one of 46 students inducted into Central Penn College’s Gamma Beta Phi at the organization’s recent ceremony in the college’s Capital BlueCross Theatre. The GBP Society is a national honor and service organization dedicated to recognizing and encouraging excellence in service, scholarship and character. PITTSBURGH — The franchisee owners of local Great Clips salons, recently awarded two scholarships. n Makenna Dunio of Altoona, a student at the Greater Altoona Technical Center in Altoona. n Melissa Troy of Roaring Spring, a student at The Salon Professional Academy in Altoona. Thousands of cosmetology students across North America applied for the 2018 Great Scholarship. To be eligible, students submitted their responses to questions related to their strengths, attributes and career goals in the cosmetology industry. The scholarship program awards $100,000 each year to cosmetology students throughout North America, with individual awards ranging from $250 to $1,500. Great Clips has more than 4,000 salons throughout the U.S. and Canada.